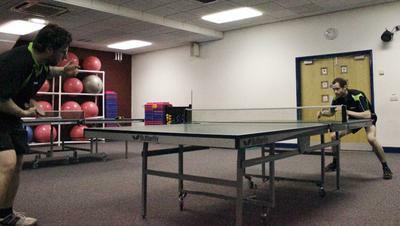 East Manchester Table Tennis Club is located in Manchester, England. We formed in March 2015, so we are very new. Visitors of all ages and all abilities are welcome to come to our club. The cost is £3 per hour currently, which includes coaching if the player would like coaching. We are looking at ways to subsidise/reduce this, so the more people that turn up the cheaper the cost will be! Currently we only operate between 6pm and 10pm every Friday, although we will be looking to expand our sessions when more people come along to play. We have 4 tables but more are coming in July 2015. We operate out of a dance studio and the atmosphere is relaxed and friendly and there are people available to provide any assistance and guidance if it is requested. We have a core group of five or so players, but we have a wider group of players who come on an ad hoc basis in excess of twenty. As we formed during the local league season we have not yet entered the local Manchester League, however we will be entering at least one team in the local Manchester league as of September 2015 (we have already been in contact with the person who runs the local league). The more people who come and express an interest in joining the club will result in the more teams we are able to enter into the league. The best things about our club are being able to have fun in a relaxed environment but at the same time having the facility to seriously improve your game for those who are interested. Whilst our coaches currently do not hold formal qualification they are going to be undergoing formal coaching in the coming months. One of our coaches has however previously held coaching qualifications in England and in China (both of which have now expired). We are hoping to be in receipt of some funding shortly which will enable us to replace some of our equipment, buy more tables and move into the sports hall in the venue we play out of, so the future looks promising for the club, so now is a perfect time to join!